Why Roll Back NJ Environmental Standards To Federal Minimums? Why handcuff DEP enforcement? And why would Democrats join Governor Christie in doing so? 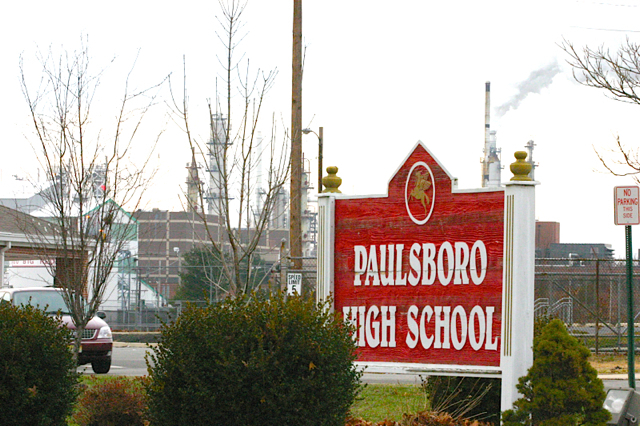 Paulsboro High School in shadow of Valero toxic air emissions – in Burzichelli’s district. Less than 48 hours after the first “public” (by invite only) meeting of the “Red Tape Review Group” led by the new Regulatory Czar established by Governor Christie’s Executive Orders #1 (a moratorium on certain regulations) and EO#2 (“common sense” regulatory policies including cost benefit analysis and rollback to federal minimums) and EO #3 (Red Tape Review Group) (for press coverage of that meeting, see “NJ red-tape review board gets an earful“), today an Assembly Regulatory Oversight Committee rammed through a dangerous bill to gut enforcement of a broad array of DEP public health and environmental protections. The bill in question, A2464 (Burzichelli (D – Valero), was not even drafted or formally introduced at the time of the hearing. The bill was opposed strongly by virtually all environmental groups. Following this testimony, a committee aide read the extremely complex bill aloud, with extensive amendments. Amazingly, not even having read what they were considering, the Committee then voted unanimously to approve and release the bill. Assemblyman Burzichelli – is he representing Valero or his constituents? Burzichelli’s Committee also took testimony on proposed legislation to block state agencies from adopting regulations that are stricter than federal minimums without prior and explicit legislative authorization (in other words, rollback followed by paralysis). Both moves have been long sought and were loudly applauded by lobbyists for the highly polluting chemical and energy industries. And it was no secret that DEP and environmental regulations were the target of both bills. But why on earth would the Governor’s rollback agenda – bad policy, deeply unpopular, and opposed by 79% of New Jerseyans according to a recent poll – be supported by democrats in the Legislature? 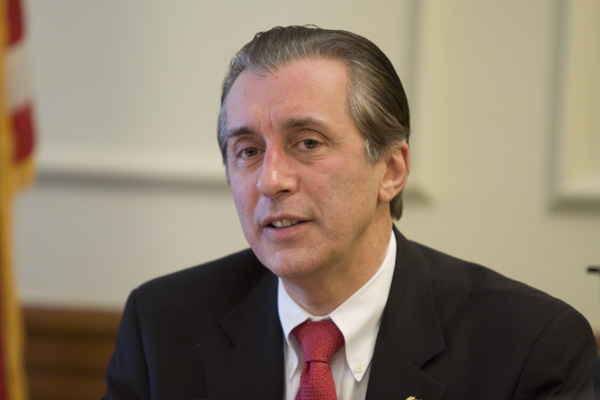 Burzichelli and the Committee hid behind the Christie Executive Orders’ “Red Tape” process to target and scapegoat DEP and environmental regulations as causing or contributing to the economic collapse. While the testimony focused on legal esoterica of administrative law and environmental regulation, it was obvious from the outset – despite repeated denials by Burzichelli – that the agenda and policy objective was to use the economic crisis as a pretext and to provide cover for an extremist DEP and environmental dismantling exercise long been sought by the polluters and developers of NJ. Now that the dual economic and fiscal crises have hit, industry lobbyists are cynically, viciously, and shamelessly exploiting the situation. The committee will hear testimony from the public concerning the feasibility of prohibiting a State agency from filing with the Office of Administrative Law a notice of proposal or notice of adoption for any rule that would exceed federal standards or requirements unless specifically authorized by State law. A-2464 Burzichelli – Requires all State agency rules be published in NJ Register, and prohibits use of regulatory guidance documents unless specifically authorized by State law. DEP testified in support of the legislation by announcing that Acting Commissioner Martin will soon issue an Administrative Order that will make all existing DEP guidance voluntary. In another radical departure from 35 years of policy and administrative practice at DEP, Martin will mandate that only adopted regulatory requirements are enforceable. Assistant Commissioner Kropp even admitted that the intent was to shield newly Licensed Site Professional toxic site cleanup contractors from enforcement actions by DEP or the newly created Licensing Board. After having successfully privatized the NJ toxic site cleanup program, polluters are now seeking to gut the technical requirements of the cleanup program, which are implemented via “guidance documents”. Recent very high profile illustrations of the importance of enforceable DEP guidance documents and Technical Manuals are: 1) chemical vapor intrusion into 450 homes in Pompton Lakes from the Dupont site; 2) chemical vapor intrusion into Atlantic Highlands Elementary school from a nearby toxic site; 3) toxic air pollutions and cancer risks assessments in Paterson NJ. The environmental indicators that justify NJ’s stringent environmental and public health regulatory protections are uniformly dire. NJ is the nation’s most densely populated state with the most cars, most development, most pavement and most toxic pollutants per square mile. NJ’s precious shore is highly over-developed and vulnerable to storms and sea level rise. Yet we continue to lose more than 15,000 acres of forests, farms, and wetlands per year to new development. NJ’s racially and economical segregated urban communities bear unjust disproportionate pollution and health burdens. Contradicting lots of empty political rhetoric about reducing emissions, NJ’s greenhouse gas emissions continue to rise steeply. NJ has the most toxic Superfund sites and more than 20,000 other toxic sites. Communities are threatened by at least 15 chemical facilities, where an accident or terror attack could kill more than 100,000 residents. In NJ, more than 65% of streams and rivers and 100% of lakes fail to meet water pollution standards and lack cleanup plans. Statewide Fish Consumption Advisories warn that fish and shellfish are too toxic to eat. Over 12% of residential water wells fail health standards. The entire state does not meet health based standards for air pollutants ozone, fine particulates, and numerous cancer causing toxic chemicals; and not surprisingly NJ has the nation’s highest cancer and asthma rates. No wonder, according to a recent Monmouth University/Gannett poll, 79% of NJ residents – on a bipartisan and socio-economic basis – oppose rollbacks on NJ’s strict environmental regulations as a solution to the state’s dual fiscal and economic crises. How do we stop this? Can anything be down at this point? Bob – Short of media coverage, public outporing of support, and some leadership from those who know better, I don’t see a good outcome. I’ve been calling and emailing Senator Smith and Buono, who have been solid supporters in the past. To just slow down this juggernaut will take a coordinated campaign and state and local ENGOs. The bad guys have out organized us – they even used Dupont Pompton lakes to BLAST DEP. THe scumbags had no fear at all! What can we do? This is horrible!!! This is just more B.S. Anything I can do Bill, Let me know as you have been there for the people……….. I wonder how these people live with themselves…….are we at their mercy? Whatever I can do to help. I read this post with great interest. I am trying to figure out which rules/programs are in fact threatened by A2486 – how did you come up with your list of 44? You say that you “ran rapid fire through a list of major NJ environmental programs” – how did you do this? Thank you! HiANja – thanks for your intest. 2) the bill was amended, as I’ve since written, to exempt the re-adoption of existing rules. Therefoee the list of 44 existing rules I initially posted is no longer valid. The current version of the tbill would apply only to new rules DEP (or other state agency) might propose for currently unregulated activities (e.g. global warming, precautionay principle, unregulated contaminants, cumulative impacts, TMDL, et al). It also might apply to the re-adoption of existing ules with amendnments – which is a a huge new problem created by the amendments. (all rules sunsnet (expire) and must be readopted on a 5 year schedule). Glad to answer any other questions you have. Any way, it is a really bad bill. WolfeNotes.com » Will Christie “Red Tape Review Group” Be A Death Panel? WolfeNotes.com » More DEP Technical Manuals on the Way?